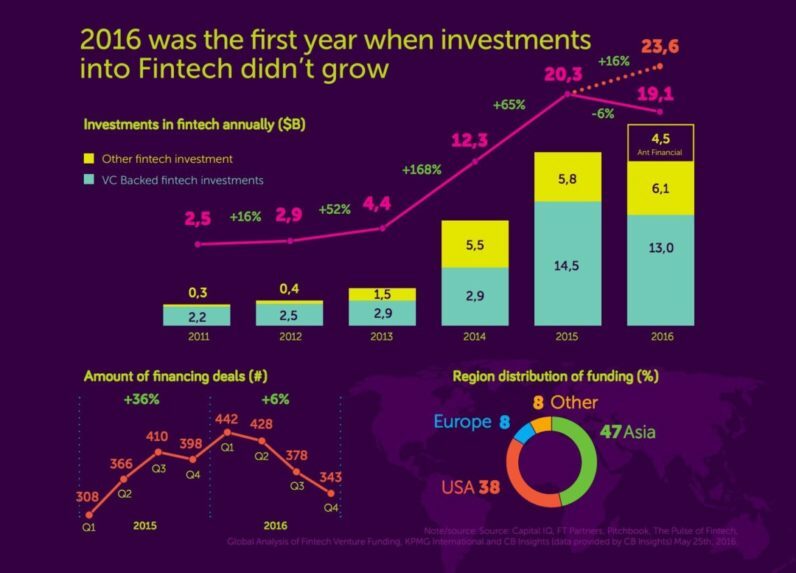 This time has come: VC investments into fintech industry have not grown globally and the market has almost reached its saturation point in 2016. The amount of VC investment in 2016 was $23.6 billion, which is 16% higher than in 2015. However excluding Ant Financial (AliPay) investment deal of $4.5 billion (which is abnormal for the whole tech industry, not even fintech), the fintech market decreased by 6% in 2016, as you can find in the new issue of “Money Of The Future 2016\2017” fintech report. Business metrics (customer base, transactional volume, revenue and income) of many notable fintechs in 2016 were not impressive at all (actually most of them are still unprofitable and growing not as fast as expected), that is why many investors finally cooled down. As an example, you can take a look at public fintech companies: they are still unprofitable or just reached breakeven (Square, Lending Club, Ondeck). At the end, I have to mention that fintech undoubtedly remains #1 industry in the VC space by investment volume and it’s even increased its share to 19% of the whole VC market in 2016, while overall VC industry slightly decreased in 2016 (by 9%). Asia’s share of global fintech investment is 47% in 2016! Sounds impressive? What is even more impressive is that more than 80% of invested capital went towards firms in China, meaning that China has finally become the dominant power on the global fintech landscape, surpassing US and all others, which was never the case before 2016. Unfortunately 2016 was quite poor for notable exits in the fintech space. While quite descent amount of M&As happened, only few of them can be considered as successful for founders and investors. Most of fintech startups were acquired to get an access to their technology, not because of their business successes, meaning that multiples were quite low (similar to traditional software companies and much lower than in tech VC). IPO exits looked even worse — only few traditional payment and financial services companies went public, no any bright startups. However it worth noticing that few awaited IPOs were postponed in 2016 and we expect to see them in 2017. Lending and payments startups still dominate on the fintech market, accounts for more than 50% of the industry both in number of investment deals and M&A deals. The fastest growing segment is insurtech, which doubled its share in 2016. Blockchain still remains a relatively small vertical: it accounts to less than 2.5% of the whole industry, despite a lot of noise and PR around it. Even without considering Ant Financial ($60+ billion valuation and worldwide expansion ambitions), Chinese fintech giants occupy the Fintech Hill: Lufax, ZhongAn and JD Financial. And these companies are notable not only due to their huge customer bases, operational records and funding attracted. They create a unique customer journey by expanding their product line and significantly increasing value proposition for the end-users. As an example, Lufax, started as a p2p-lender, successfully jumped into wealth management business providing opportunity for Chinese customers to invest into foreign stock. Who will be able to compete with these monsters from China in the next few years for the global leadership? I bet on Stripe, TransferWise and SoFi who seem to be the most sustainable or/and scalable businesses in the fintech world. While Chinese players are fighting for local leadership, some of the US/EU players has successfully started global expansion and conquer emerging countries in Africa, LatAm and Asia.